Stephen William Hawking CH CBE FRS FRSA ( born 8 January 1942) is an English theoretical physicist, cosmologist, author and Director of Research at the Centre for Theoretical Cosmology within the University of Cambridge. Among his significant scientific works have been a collaboration with Roger Penrose on gravitational singularity theorems in the framework of general relativity, and the theoretical prediction that black holes emit radiation, often called Hawking radiation. Hawking was the first to set forth a cosmology explained by a union of the general theory of relativity and quantum mechanics. He is a vocal supporter of the many-worlds interpretation of quantum mechanics. He is an Honorary Fellow of the Royal Society of Arts, a lifetime member of the Pontifical Academy of Sciences, and a recipient of the Presidential Medal of Freedom, the highest civilian award in the United States. Hawking was the Lucasian Professor of Mathematics at the University of Cambridge between 1979 and 2009. Hawking has achieved success with works of popular science in which he discusses his own theories and cosmology in general; his A Brief History of Time stayed on the British Sunday Times best-sellers list for a record-breaking 237 weeks. 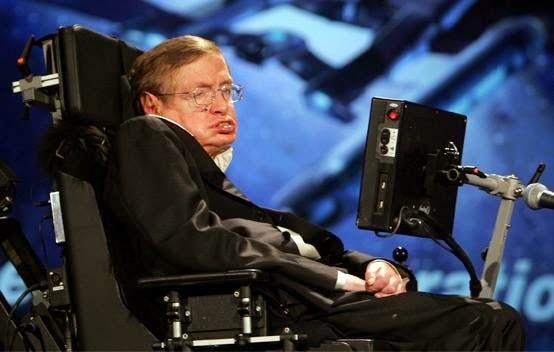 Hawking has a motor neuron disease related to amyotrophic lateral sclerosis (ALS), a condition that has progressed over the years. He is almost entirely paralysed and communicates through a speech generating device. He married twice and has three children.